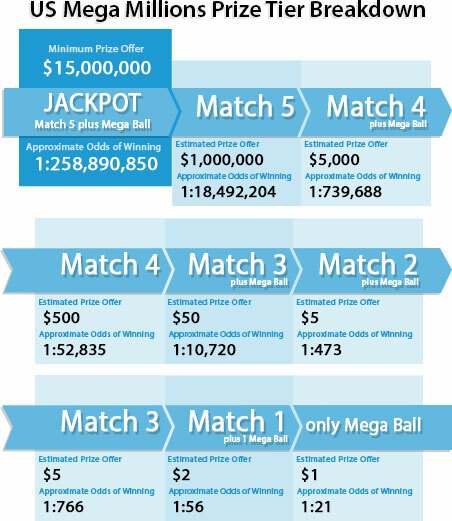 US Mega Millions is an American multi-jurisdictional lottery game offered in 44 states plus the District of Columbia and the U.S Virgin Islands. The first draw was held in 2002. The minimum jackpot is $40 million, which rolls over when there are no winning matching ticket. US Mega Millions currently holds the record for the highest jackpot won in US lottery history, a massive $656 million. The draws are held every Tuesdays and Fridays 11:00pm Eastern Time in Atlanta, Georgia. Match the 5 main numbers and 1 Megaball number to win the jackpot prize. Choose 5 main numbers from 1-70 and 1 Megaball number from 1-25 or you can click “Lucky Pick” to play with auto-generated numbers. Choose your draw days. You can play for either Tuesday or Friday draw or play for both draw days. "After placing your order with us, you will receive your OneLotto official ticket(s), which can then be viewed within your “My Account“ page. Once the winning numbers and prize breakdown have been officially announced, OneLotto will publish and upload the results onto our website. We will also send out a full result email to all participating players.